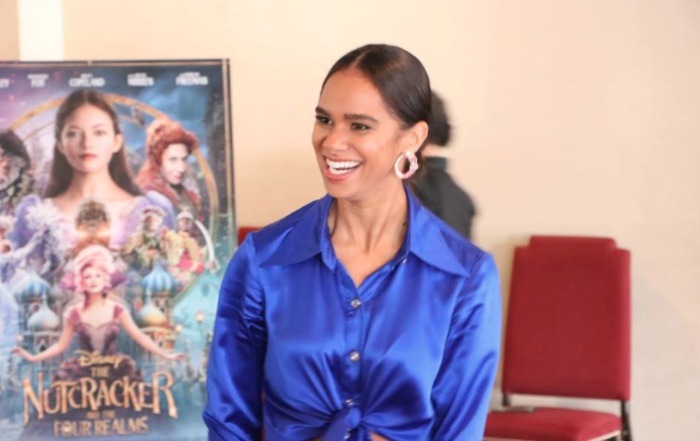 I’ve been sharing with you my time in LA at the World Premiere Red Carpet event for THE NUTCRACKER AND THE FOUR REALMS and my interview with the movie’s main character Mackenzie Foy and today I’m sharing with you my interview with Misty Copeland plays the part of the ballerina in this movie. 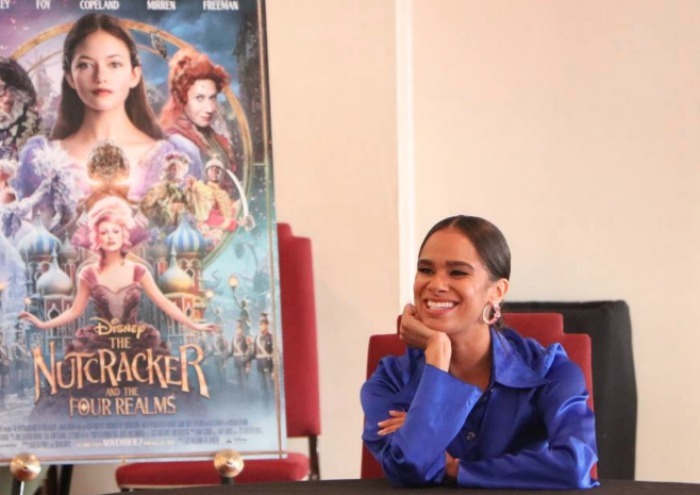 A unique role in the film, Misty has no speaking parts but instead, dances through the realms to bring us full circle into The Nutcracker story. In my opinion, they couldn’t have picked a better person to literally dance the magic into this movie. Did Misty have to do any special training for her role in The Nutcracker and the Four Realms? No! In fact, she just went into the film with improve and movement and as you will see, it’s fantastical and brings together all of the movement and beauty that you would expect to see. First introduced to the ballet at 13 through a scholarship into the local ballet school, Misty quickly found her place in the world even though that place wasn’t necessarily where the rest of the wold might think she belonged. She fought though and broke down and continues to break down so many barriers showing the world, and specifically young girls that they too can do anything despite where they come from, the color of their skin, the size of their bank account, etc. I think that it’s hard for young people to ask for support or guidance and that’s been my saving grace with everything. Especially as young people, we don’t have all the tools to push through when you have an obstacle but I think that it’s important to first have belief in yourself. Like TRUE belief that you don’t have to look like the person next to you. That what you see on Instagram isn’t necessarily beauty just because that’s what’s pushed in your face. That being an individual is so much more beautiful and being unique. I feel like I try to tell young people to own that and to be confident in who you are. Misty Copeland at The Nutcracker Premiere being interviewed by Entertainment Tonight. The majority of the greatest ballet dancers all started after the age of 13, which is kind of crazy … which is proof that it’s not about that. I understand the reason why they like to start you before you hit puberty, but it is possible. It’s about what you do with the time that you are in the studio. With the right support and the right will and push. If you are working with a teacher that is telling you that you can’t, then you need to go somewhere else. I feel like it’s possible to be anything that you want to be if you have someone that supports you. Misty has been very proactive in helping to make ballet accessible to all communities and I love that her personal history with The Boys and Girls Club of American brought her full circle as she is now in The Boys and Girls Club Alumni Hall of Fame and I love her passion and drive towards continuing to make huge strides in bringing more diversity to the world of dance. It’s such a difficult thing to do, and I’ve been trying to do it my entire career. I helped to start a diversity initiative through American Ballet Theater in conjunction with The Boys and Girls Clubs of American called Project Plié, that’s a diversity initiative. I’ve worked with so many different organizations and one that I hold very dear to my heart is Mind Leaps in Rwanda and it kind of allows me to see a structural thing that I can then bring back to the states. I think it’s about going to those communities and making those communities feel comfortable. Like in Rwanda, it’s not about bringing in some white teachers, it’s about training the people that are there in those communities so that they can teach their communities. I feel like that’s a huge step that we can take in this natural step of diversifying dance. Isn’t she just so lovely and so inspiring? Such a beautiful woman with a beautiful heart and soul. I think that this movie is perfect for the entire family. There are a few parts that might be scary to young viewers but for the most part, a very clean and solid family film that I think will become a holiday favorite for years to come. If you have concerns in regards to the age of young children, I would say that this film is less scary than the life-action version of Maleficent and along the same lines as the live-action version of Beauty and the Beast. The messaging in this movie is so strong, including themes about friendship, loyalty, family, courage and most of all … believing in yourself. All such timely messaging and mothers might find this movie and storyline especially moving as what Clara is looking for throughout the film ends up being exactly what her mother had wished for her all along. 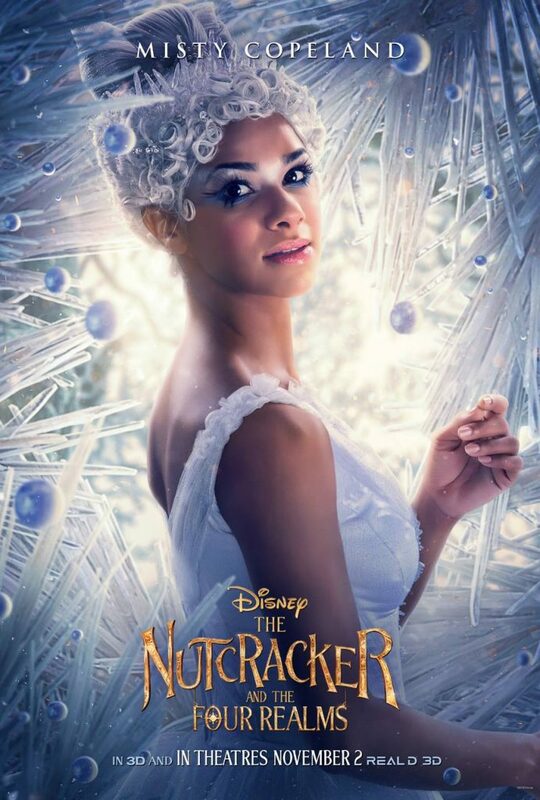 Isn’t it perfect then that Misty Copeland has such a magical role in this film?